On the positive side, when we strive to help animals by reducing their numbers in experimentation and replacing their use with non-animal research methods, we discover testing methods that more successfully predict human reactions to toxins and drugs. These human-based testing methods are proving to be better at protecting people from harmful chemicals than animal experiments, as well as providing the answers we need to find effective treatments and cures for the diseases that ail us. Do we need to make a choice to either protect animals or humans? This is certainly what those who profit from hurting animals would like everyone to believe. Advocates of animal experimentation especially employ the fallacy of a false dilemma: that we must choose to care about human suffering or about animal suffering, and that we cannot do both. This erroneous thinking leads us to believe that we must either experiment on a mouse (or a dog or monkey …) or we must experiment on a human child, implying that we are forced to make a choice—it’s the animals or us. 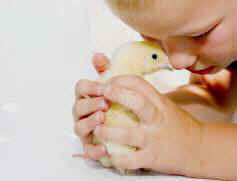 However, not only is this notion that we must either protect animals or humans not true, in fact, the opposite is true. The human plight is inextricably tied with that of other animals. A substantial proportion of the most significant and urgent public health issues we face today are intricately linked with how we treat animals. This includes domestic violence, infectious disease pandemics, climate change, rise in chronic diseases, environmental degradation, and medical research failures. Here’s a quick exploration of some examples, which reveal how poor treatment of animals negatively impacts us. Animal abuse is one of the most reliable indicators of domestic violence and abuse of children. The abusers easily hurt all family members, including the animal members, who are often the only source of companionship and comfort for the human victims. Studies repeatedly indicate a link between violence against animals and against humans. Yet, when animal abuse is ignored, not only do the animals continue to suffer, we may also fail to detect cases of partner and child abuse. Our unprecedented worldwide consumption of animals for meat, eggs, and dairy products is hazardous-both to other animals and to us. Animals raised for food are now ubiquitously crammed into factory farms, living in profoundly filthy and cruel conditions. The high stress animals face as a result of these conditions create perfect breeding grounds for new, deadly diseases such as bird flu. Annually, billions of animals are caught from the wild or bred in captivity and then sold in the wildlife trade. They are sold live or in body parts as exotic pets, entertainment for circuses and zoos, food, skins, ornamental or medicinal objects and for experimentation. Animals suffer tremendously as they are passed from one dealer to another, shipped overseas or slaughtered on site in horrendous ways. The trade creates very sick animals and ideal conditions for pathogens to multiply. It led to the emergence and spread of HIV/AIDs, Ebola, Severe Acute Respiratory Syndrome (SARS) and monkey pox. To tackle these infectious and other diseases, millions of animals are experimented on every year. In the name of research, animals are crushed, burned, poisoned, infected, drowned and blinded under the guise that it will benefit humans. Yet animal experiments are unreliable predictors of human outcomes and their use has led to human harm. Additionally, we may have abandoned countless medical treatments, which would have worked spectacularly in humans, because of misleading animal experiments. Reducing, or better yet, eliminating altogether, our consumption of animals confers great personal health benefits. By going vegan, we are much less likely to suffer from strokes, diabetes, and cancers. Going vegan will help us stay slimmer and live longer, healthier lives. Additionally, lessening our consumption of animals will decrease the number of factory farms, and thus the number of animals living in such conditions. This in turn can help us avoid pandemics and limit further destruction of our environment. The examples presented here all illustrate the important connection between animal treatment and human welfare. When we treat other animals with basic kindness and decency, there are direct and indirect benefits to human health. When we treat animals poorly, our health suffers. In other words, what’s good for other animals is also what’s good for us. Aysha is a neurologist and public health specialist. She is the author of the book, Animals and Public Health. Why Treating Animals Better is Critical to Human Welfare, which examines how the treatment of animals impacts human health. Dr. Akhtar is a Fellow of the Oxford Centre for Animal Ethics, works for the Office of Counterterrorism and Emerging Threats of the U.S. Food and Drug Administration (FDA), and serves as LCDR in the US Public Health Service. She is a regular blogger for the Huffington Post. You can read her blogs on how animal protection benefits human health here. You can follow her on twitter @DrAyshaAkhtar and visit her website. Finally, since she works for the government, Dr. Akhtar must provide the obligatory disclaimer: "The opinions expressed here are those of the author and do not represent the official position of the U.S. Food and Drug Administration or the U.S. government." You can read more of her articles at her HuffingtonPost Blog page. Want to know more? Check out Aysha's website and Facebook page. Aysha is a neurologist and public health specialist. She is the author of the book, Animals and Public Health. Why Treating Animals Better is Critical to Human Welfare, which examines how the treatment of animals impacts human health. Dr. Akhtar is a Fellow of the Oxford Centre for Animal Ethics, works for the Office of Counterterrorism and Emerging Threats of the U.S. Food and Drug Administration (FDA), and serves as LCDR in the US Public Health Service. She is a regular blogger for the Huffington Post. You can read her blogs on how animal protection benefits human health here. You can follow her on twitter @DrAyshaAkhtar and visit her website. Finally, since she works for the government, Dr. Akhtar must provide the obligatory disclaimer: "The opinions expressed here are those of the author and do not represent the official position of the U.S. Food and Drug Administration or the U.S. government."